Anguilla's tradition of communal work, perhaps one of the most important traditions of the island's cultural heritage. The tradition's origins can be traced back to the time of slavery. The tradition continued once the descendants of enslaved persons of African ancestry became free, bought small plots of land, and began to work for wages. While some observors say the tradition has died out, a close look at recent history shows that it survives, even though it may be weaker today. The spirit of working together persists in Anguilla today. "Since they has no money with which to hire labour, they pooled their strength and worked for each other in an exchange labour system; the 'combite' of Haiti, the 'lift system' of the Leeward Islands, or a 'jollification' in which a man who wanted some work done invited his friends and neighbours and provided a hot meal and rum, but made no other payment." A jollification is also similar to a "maroon,' which means "a cooperative activity of self-help" accompanied with songs and fesitivities. The term is used in Montserrat, Tobago, and Barbados. "Cheerful giving to your neighbor." [. . .] A community foundation is no more than to make a jollification a financial resource as well." Anguilla's jollification tradition is “warm in the hearts of the people” even though it was already taking place less frequent than it had in previous years. "In the old days, people used to invite men and women to help them with their grounds. The men usually ploughed the grounds and some of the women used to help plant. Others helped to prepare the food. The women who prepared the food usually woke up early and made the flour for the johnny cakes. After that they made the tea. When they were done they called the men for breakfast and after the men ate they went back to work. Jollification: "Anguillians helping Anguillians out of the goodness of their heart through cooking, washing, cleaning, and helping the community look sharp." "In the old days our ancestors used to have jollifications. the neighbors and friends came together and helped out in the ground. They planted peas, corn, and other crops or weeded around the small plants. They would all work from early day till late evening. Aunt Mary had a piece of ground to plow so she asked friends and neighbours to bring their hoes. She gave them bush tea with johnny cakes and eggs to eat before they started to plow. As they toiled with their hoes, with the shovel and forks on the ground Aunty Jane cooked peas and rice with stewed goat for lunch. They sat under the tamarind tree and shared the meal, looking at the ground they turned. As the sun started to set with the peas in the ground it was time for some jollification fun. So, Uncle Charlie brought out some demijohn of rum. At the end of it they were all drunk and Aunt Mary thanked them for helping her out. 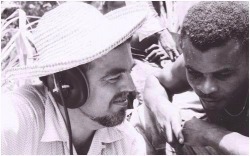 Anthropologist and folklorist Alan Lomax visited the Leeward Islands, including Anguilla in 1962. He was interested in commonalities across the cultures of individual islands. This is probably one of the reasons he asked so many questions about the tradition of jollification. His research was to be used as a resources by the Federation of the West Indies. The Federation of the West Indies no longer exists, but the spirit of cooperation that Lomax documented thrives today.